I can't take my iPhone 5 videos (.mov) and load them into the timeline. Any suggestions why this is happening? I was excited to see how great the video is from the iPhone 4s. I have taken one hour 1080P videos of lectures that look great. However, when pulled into Premiere (CS5), the sound goes out of sync to the point that it is unusable after about seven minutes. I have checked the original file (.MOV) using QT - it plays perfectly. Indeed, I can trim and split the file using QT and I know that creating a bunch of small videos to link in Premiere would be a solution of sorts. The iPhone (including iPhone 6, iPhone 6 Plus, iPhone 5S, iPhone 5, iPhone 5C, iPhone 4S, etc.) records in MPEG-4 and outputs its files as .MOV files (the container). Files are compressed using the h.264 codec (as opposed to AAC or Xvid and DivX usually found in .AVI containers). So the files you are getting out of iPhone are suited to be delivered as is, which is usually not what you want. Since both the H.264 codec is a final delivery codec it is not one you want to use for editing. To edit iPhone Videos in Premiere Pro (CC/CS6) smoothly, the easy workaround is to transcode them to a more editing-friendly format, such as MPEG-2. This article would show you how to convert iPhone video to Premiere Pro highly compatible format step by step with a professional Video Converter for Mac from EaseFab. By running it, there's no need to set the codec yourself: the program has optimized presets for Adobe Premiere (Premiere CC included). You can convert any video file to Adobe Premiere compatible format without losing any quality on Mac OS X(Yosemite/Mavericks included). If you're using a Windows computer, simply turn to Video Converter for Windows. After downloading, install and run this program, just copy the MOV files from your iPhone to your hard drive. Then click "Add Video" to import the files to the software for converting. Note: batch conversion is supported, so you can load more than one file to save time. You can also combine all the files together with this software. The program has three already optimized the video settings for Adobe Premiere Pro. 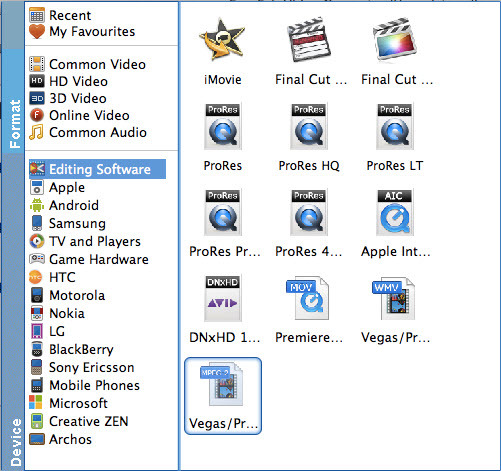 You can select MOV (Entitled Premiere), WMV or MPEG-2 from "Editing Software" as the output format. All output videos will keep the original quality of AVI video and seamlessly fit Adobe Premiere Pro CC, CS6, CS5.5, CS5, CS4 and more. Here we recommend you choose MPEG-2. Hit the big Convert button on bottom of the main windows and the conversion from iPhone video MOV to MPEG-2 for Adobe Premiere Pro will begin immediately. When the conversion is finished, you can click "Open" button to get the generated MPG files effortlessly. Launch Premiere Pro on your PC, choose "File > Import to import converted iPhone videos in Adobe Premiere Pro CS4/CS5/CS5.5/CS6/CC for further editing.